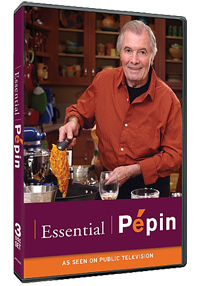 Welcome to Essential Pépin, Jacques Pépin’s newest cooking series, airing on KQED this fall. In his 13th show with KQED, the legendary chef and renowned teacher once again shares his food, family, and passion for cooking with us. With 125 recipes hand-picked by Jacques from his extraordinary career, Essential Pépin has a tempting dish for every occasion and appetite. Warm yourself up with comforting Gratin Dauphinoise on a cold winter night, or invite your friends over for a dinner party and impress them with Escoffier Quenelles, Poached Salmon in Ravigote Sauce and then finish the meal with Apricot and Pistachio Soufflé. Step-by-step, Jacques will lead you through each recipe, dispensing cooking advice and demonstrating techniques, all with his trademark verve and vigor that is as contagious as it is charming. In addition to watching the series on television at its regularly scheduled time, we are also making it possible for you to watch the entire series — all 26 episodes — online. On this site, you will have access to each episode a week before it airs on television. If you miss even a part of one, check back here to watch it in full. You will also be able to print out Jacques’ recipes (2-4 from each episode) to make in your own kitchen. View TV Program Schedule for KQED or check your local PBS station for airtimes.